Not allowing myself to be put off by first having to scrape ice from the car windows at 6.30 am, and heading up onto the moors last Wednesday morning was definitely my best decision of that week. Better still, when later on I found that most other folk seemed to have stayed in bed, leaving Exmoor at its most peaceful and tranquil. 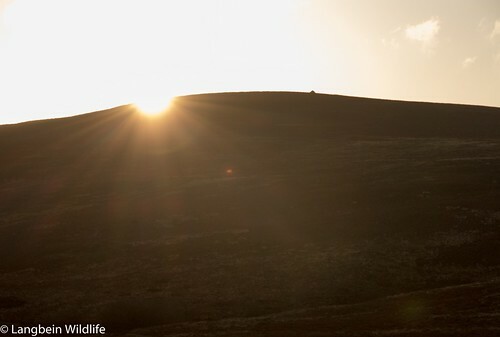 Walking for an hour from first light through icy puddles, weighed down by my tripod, video and stills camera, I neither heard nor saw any sign of wildlife during an almost eerie calm just before the sun emerged from behind Dunkery Beacon – the highest point on Exmoor. 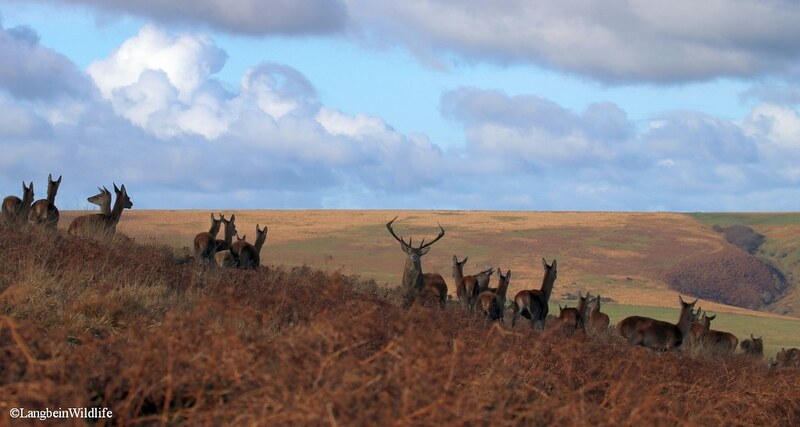 Even without sightings of any wildlife the views from up there are always stunning, showing off the diverse blend of moorland, woodland, pasture and coastal habitats that epitomise Exmoor National Park in a single vista. 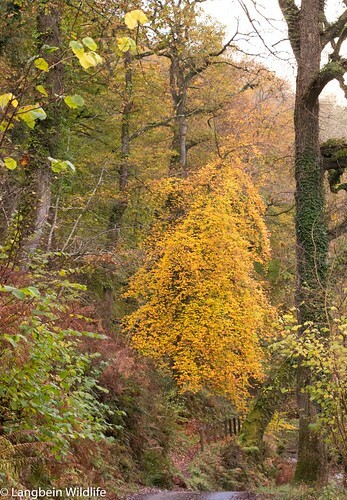 I began to feel that I may see little of the deer that I had come to film here, and decided to walk back to my car via a detour through the many lower lying sheltered combes and autumnal-looking oak woods. 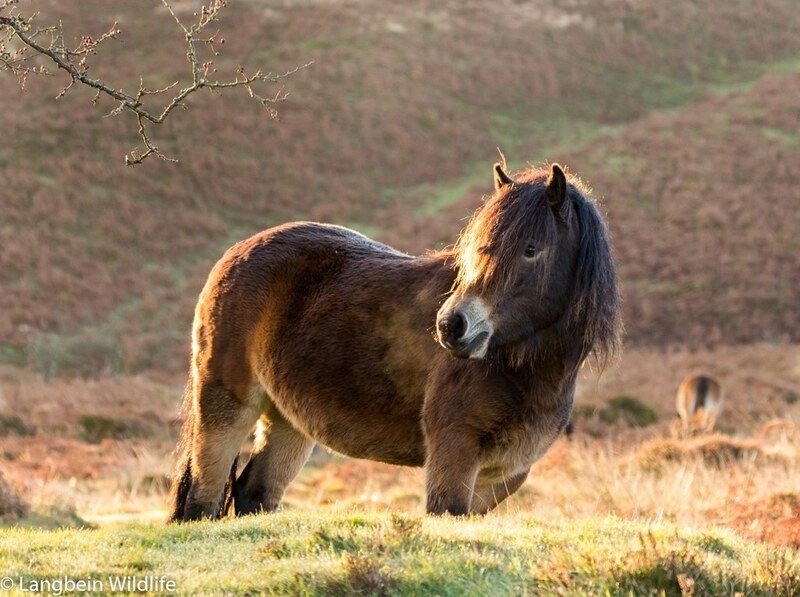 Eventually I spotted a few of the hardy Exmoor ponies, that live on the moor year round, grazing on small patches of grass in between the heather, lit up by the first rays of sun. 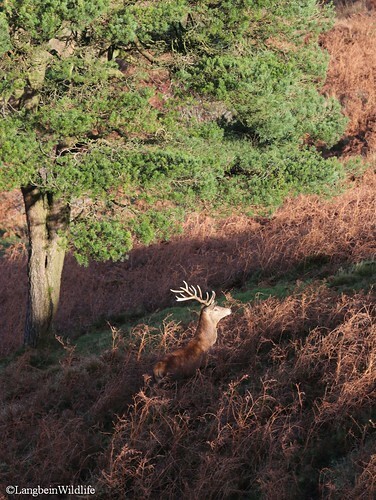 Then, much to my surprise, I spotted a few brown ears twitching among the heather and bracken no more than eighty metres below me, which from a quick look through the zoom on my camera I could see were a group of red deer. 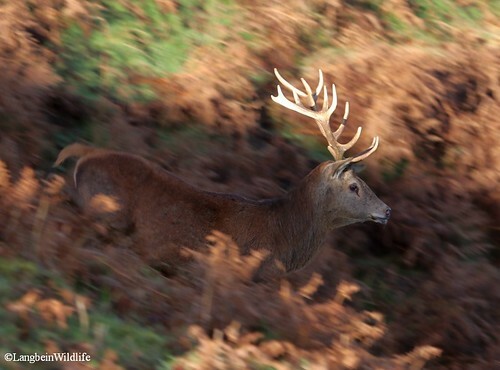 Although through the brown fronds of wilted bracken that I was hiding behind I was unable to get a clear view of how many there were in all, I could see at least several hinds and calves as well as one fair size stag. Some were lying down and others browsing partially out of sight further down the slope. I settled down, not daring to move to take any pictures for at least 15 minutes, (“that’s a record!” I hear my wife say !) to enjoy that unrivalled feeling when able to watch wild animals close-up, behaving naturally but totally unaware of my presence. Eventually, having waited for a moment when all deer were head-down or facing away from me, I dared slowly to raise my video tripod, to get a few quick clips of them before they would most likely spot me when they stood up. As luck would have it, they did get up suddenly but looked away from me downhill in the direction of another stag that was bolving (the roar stags make during the mating season) in the distance, but appeared to be coming ever closer. The herd however appeared to ignore him and casually started to walk off towards the next combe, enabling me to stand up without startling them. Once they were a little further away I decided – as I often do while filming deer – to show myself clearly to the deer, and let them see me walking gradually away at an angle while still keeping them in view. I often prefer this to attempting to stalk up closer to red deer, which more often than not results in startling them, and in photos of a lot of rear ends or of alarmed deer looking at the camera. Instead, I find it much better to try to predict where the herd will head next if not pushed, and re-approach using the slope of the land to provide cover while getting into a new position where the deer are likely to come into view again. Soon I was rewarded by seeing the herd – which turned out to be much larger than I had thought – reappear ambling up to the top of the next combe. 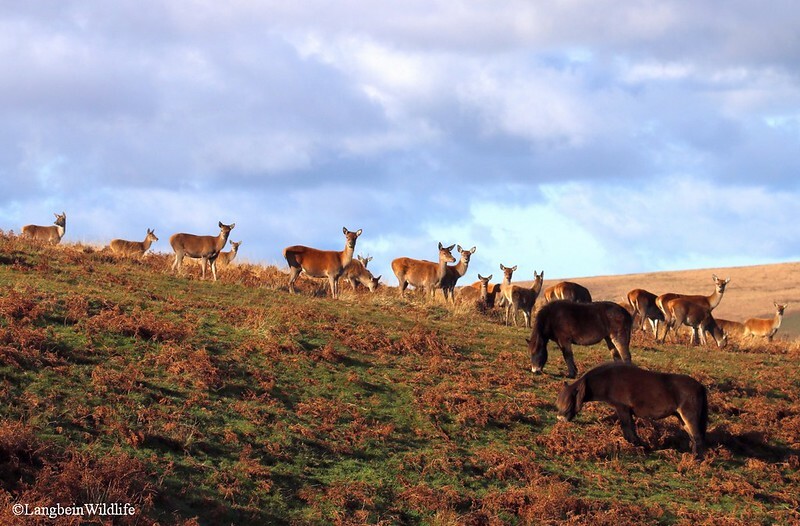 They hinds and calves grazed calmly, while the lay down unperturbed by several Exmoor ponies close-by, and taking no notice of me settled in full view of them, but on the other side of the combe. Having watched quietly for some time, the stag I’d heard bolving previously suddenly ran up the slopes to join the herd. The resident stag, which had appeared to be holding the herd, immediately moved to the edge of the group and stared to graze head-down; a typical displacement behaviour signalling his sub-dominant status to the other stag that had suddenly appeared. However, after just five minutes of inspecting the hinds and taking in their scent to check if any were yet to come into oestrus, he took off again and headed directly towards me. At first I thought he might truly be aiming for me, but rather than pretending to graze, in my case I stood up and made sure the stag could clearly see that my tripod was not a set of antlers! Untroubled, he calmly trotted past me back down into the combe to re-join another smaller group of hinds that were clearly of much more interest to him. Meanwhile the other deer were all still stood up above looking at me, allowing me to get a few more close photos of them in the bright late autumn sunshine. I retreated to leave them all in peace, and returned home via Porlock Common to take in just a few more of my favourite Exmoor views. View from Porlock Common over Bossington Hill and the Bristol Channel. 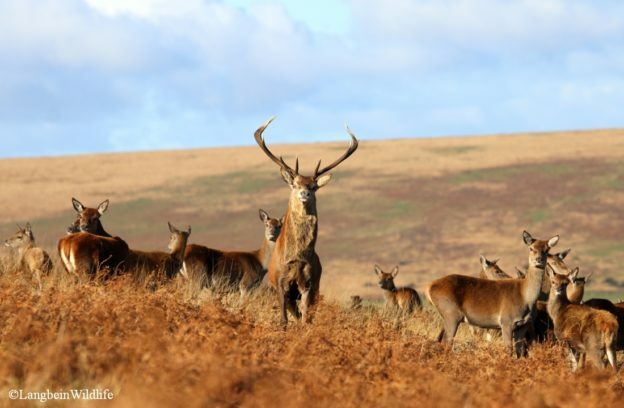 This entry was posted in Deer, Exmoor, Wildlife and tagged autumn, Deer, Exmoor, Exmoor National Park, Exmoor Pony, Landscape Photography, NTHolnicote, Photography, ponies, Somerset, Wildlife photography on November 13, 2017 by jochblog.